Objectives: The low frequency of survival of stem cells implanted in the myocardium after acute myocardial infarction may be caused by inflammation and oxidative stress in the myocardial microenvironment. We evaluated the effects of a traditional Chinese medicine, Compound Danshen Dripping Pills, on the cardiac microenvironment and cardiac function when used alone or in combination with human umbilical cord blood mononuclear cell transplant after acute myocardial infarction. Materials and Methods: After surgically induced acute myocardial infarction, rabbits were treated with Compound Danshen Dripping Pills alone or in combination with human umbilical cord blood mononuclear cell transplant. Evaluation included histology, measurement of left ventricular ejection fraction and fractional shortening, leukocyte count, count of green fluorescent protein positive cells, superoxide dismutase activity, and malondialdehyde content. Results: Combination treatment with Compound Danshen Dripping Pills and human umbilical cord blood mononuclear cell transplant significantly increased the survival of implanted cells, inhibited cardiac cell apoptosis, decreased oxidative stress, decreased the inflammatory response, and improved cardiac function. Rabbits treated with either Compound Danshen Dripping Pills or human umbilical cord blood mononuclear cells alone had improvement in these effects compared with untreated control rabbits. Conclusions: Combination therapy with Compound Danshen Dripping Pills and human umbilical cord blood mononuclear cells may improve cardiac function and morphology after acute myocardial infarction. Animal studies and clinical trials have shown the potential of stem cells, including human umbilical cord blood mononuclear cells, for regenerating and repairing the myocardium and blood vessels after ischemic injury and improving cardiac function after myocardial infarction.1-3 A major challenge of stem cell therapy is the low frequency of survival and differentiation of implanted cells in the damaged tissue.4-7 Most implanted donor cells do not survive in the microenvironment created by acute myocardial infarction. Therefore, it is important to protect implanted stem cells in vivo to improve the success of stem cell therapy. Compound Danshen Dripping Pills (CDDP), which is known as Fufang Danshen Diwan in the Chinese language, is a traditional Chinese medicine that has pleiotropic effects including protecting endothelial function, increasing nitric oxide bioavailability, and antioxidant and anti-inflammatory effects.8-10 We hypothesized that treatment with CDDP may improve the cardiac microenvironment created by acute myocardial infarction and may improve the survival and therapeutic efficacy of implanted human umbilical cord blood mononuclear cells in vivo. Reagents included CDDP (Tianjin Tasly Phar-maceutical Co. Ltd., Tianjin, China), lymphocyte separation buffer (Tianjin Bioengineering Companies, Tianjin, China), terminal deoxynucleotidyl transferase deoxyuridine triphosphate nick end labeling (TUNEL) testing kits (Promega, Madison, WI, USA), Dulbecco Modified Eagle Medium and fetal bovine serum (Life Technologies, Grand Island, NY, USA), Lentivirus vector (Shanghai Inva Bio-Tech Co. Ltd., Shanghai, China) and assay kits for determining superoxide dismutase activity and malondialdehyde content (Beyotime Institute of Biotechnology, Shanghai, China). The study protocol conformed to the principles outlined in the 1975 Declaration of Helsinki and was approved by the Human Research Committee, Xiangya Hospital, Changsha, China. After informed written consent had been obtained from the mothers, human umbilical cord blood samples were collected from placentas of healthy, full-term neonates immediately after delivery at the maternity department of Xiangya Hospital. Umbilical cord blood samples (mean volume, 75 ± 13 mL) were stored in blood donor collection bags (250 mL) containing citrate-phosphate-dextrose-adenosine anticoagulant (28 mL). Nucleated cells were separated by sedimentation with 1.2% hydroxyethyl starch in 0.9% sodium chloride. Low-density mononuclear cells were collected after separation (Ficoll-Paque, Shanghai Limin Co. Ltd., Shanghai, China). The buffy coat was collected, washed twice with low-glucose Dulbecco Modified Eagle Medium, and resuspended in regular Dulbecco Modified Eagle Medium with 20% fetal bovine serum and 1% penicillin. Cell viability was determined using the trypan blue dye exclusion method. Only freshly isolated human umbilical cord blood mononuclear cells were used for cell transplant. Cells were labeled with Lentivirus vector-mediated green fluorescent protein for 48 hours before transplant. Labeled human umbilical cord blood mononuclear cells were suspended in normal saline (1 ×107/500 μL) before transplant. The number of positive green fluorescent protein cells and the efficiency of transfection were measured with fluorescence microscopy. Study protocols were approved by the Animal Care and Use Committee of Central South University, Changsha, China. Rabbits (20 male and 20 female rabbits; age, 3 to 4 mo; weight, 1.5 to 2.0 kg) were obtained from the Animal Experimental Center of Xiangya Hospital. The rabbits were anesthetized by intravenous injection of 3% pentobarbital sodium. The heart was exposed through a left thoracotomy. The left anterior descending coronary artery was ligated with a 5-0 silk suture at the distal third of the artery. Acute myocardial infarction was confirmed with ST segment changes on electrocardiograms. After surgery, the rabbits were randomly divided into 4 groups (each, 10 rabbits): (1) control; (2) CDDP treatment alone; (3) mononuclear cell transplant alone; and (4) combined CDDP treatment and mononuclear cell transplant. The day after surgically induced acute myocardial infarction, saline (500 μL) was injected into rabbits in groups 1 and 2, and human umbilical cord blood mononuclear cells (1 ×107/500 μL saline) labeled with green fluorescent protein were injected slowly into the ear vein of the rabbits in groups 3 and 4. For 7 days, CDDP (117 mg/kg/d) was given by gastric tube to rabbits in groups 2 and 4, and saline (5 mL/d ) was given by gastric tube to rabbits in groups 1 and 3, as previously described.11 There were 3 additional rabbits added to the study to replace 3 rabbits that died during the experiments (cause of death: postoperative pleural infection, 2 rabbits; iatrogenic pneumothorax, 1 rabbit). Transthoracic echocardiography was performed with an animal echocardiography system (Vevo 707, VisualSonics Inc., Toronto, Ontario, Canada) with a 35-MHz transducer on all rabbits before injection and at 2 and 4 weeks after surgery. The measured indices included left ventricular ejection fraction and left ventricular fractional shortening. All measurements were averaged for 3 consecutive cardiac cycles. At 1 and 4 weeks after cell transplant, the hearts of 5 animals (selected randomly) in each group were excised. The infarcted regions of the excised hearts were cut into 4 segments along the longitudinal axis, fixed with 10% formaldehyde solution, dehydrated, embedded in paraffin, and serially sectioned (slice thickness, 3 μm). Sections were stained (Mayer hematoxylin, 8 min) and counterstained (eosin-phloxine, 30 s to 1 min). Infiltrated white blood cells were counted under magnification with an inverted optical microscope (original magnification ×200), and the counts were averaged in triplicate. Cells positive with green fluorescent protein were counted using a fluorescence microscope (CKX41 Microscope, Olympus, Nagano, Japan). The paraffin-embedded sections from the hearts that were excised at 4 weeks were dewaxed. Apoptotic cells were identified with TUNEL testing kits (Promega). Tissue sections were examined under a microscope (original magnification ×400) and ≥ 400 cells were counted in a minimum of 8 high-power fields. The apoptotic index was defined as the percentage of cells that were apoptotic. At 4 weeks after cell transplant, the rabbits that were not killed for histology were anesthetized by 3% pentobarbital sodium, and the hearts were rapidly excised. The ischemic myocardium was dissected on ice and stored at -80°C. Each sample was homogenized with buffer (0.01 mol/L tris [hydroxymethyl] aminomethane; pH, 7.5; sodium chloride, 0.1 mol/L; ethylenediaminetetraacetic acid, 1 mmol/L; phenylmethylsulfonyl fluoride, 1 mmol/L) using a spectrophotometer (721G, Shanghai Said Leith Precision Instrument Co., Ltd.. Shanghai, China). The homogenate was centrifuged (10 000 ×g; 20 min; 4°C), and the supernatant was tested for superoxide dismutase activity (nitroblue tetrazolium method) and malondialdehyde content (thiobarbituric acid measurement). Average results were reported as means ± standard deviation (SD). Data analyses were performed with statistical software (IBM SPSS Statistics for Windows, Version 19.0, IBM Corp., Armonk, NY, USA). Comparisons were evaluated with t test and 2-way analysis of variance. Statistical significance was defined by P ≤ .05. At 1 or 4 weeks after treatment, rabbits treated with CDDP alone or with human umbilical cord blood mononuclear cells alone had significantly greater mean left ventricular ejection fraction and fractional shortening than control rabbits (Table 1). Mean left ventricular ejection fraction and fractional shortening were greater in rabbits treated with CDDP and mononuclear cells than rabbits treated with either CDDP or mononuclear cells alone (Table 1). 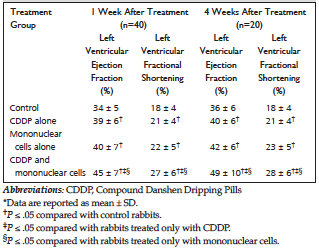 At 1 or 4 weeks after treatment, mean left ventricular ejection fraction and fractional shortening was similar between rabbits treated with CDDP alone and rabbits treated with mononuclear cells alone (Table 1). Infarcted heart tissue in control rabbits had decreased myocardial cells, irregular organization, severe fibrosis, and much inflammatory cell infiltrate (Figure 1). There were significantly more infiltrated leukocytes in control rabbits than rabbits in the other 3 groups (Table 2). The rabbits that received CDDP and mononuclear cells had a greater increase in residual myocardial cells and decrease in leukocyte count than did rabbits treated with either CDDP or human umbilical cord blood mononuclear cells alone (Table 2 and Figure 1). 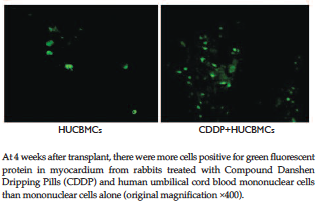 At 4 weeks after treatment, cells positive for green fluorescent protein were found only in the infarcted myocardium of animals treated with mononuclear cells alone or CDDP and mononuclear cells (Figure 2). 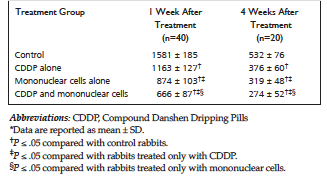 There were significantly more cells positive for green fluorescent protein in rabbits treated with CDDP and mononuclear cells than rabbits treated with mononuclear cells alone (Table 3). The mean apoptotic index was significantly lower in rabbits treated with CDDP alone (13% ± 2%) than control rabbits (20% ± 4%; P ≤ .001). The mean apoptosis index was significantly lower in rabbits treated with mononuclear cells alone (11% ± 4%) than control rabbits (20% ± 4%; P ≤ .004). The mean apoptosis index was significantly lower in rabbits treated with CDDP and mononuclear cells (7% ± 1%) than rabbits treated with CDDP alone (13% ± 2%; P ≤ .001) or mononuclear cells alone (11% ± 4%; P ≤ .02). The mean apoptotic index was similar between rabbits treated with CDDP alone or mononuclear cells alone (Figure 3). Mean superoxide dismutase activity was significantly greater, and malondialdehyde content significantly less in rabbits treated with either CDDP or mononuclear cells alone than control rabbits (Table 4). 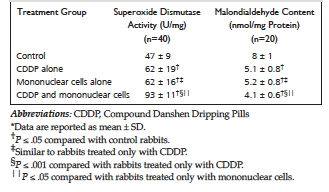 The greatest mean superoxide dismutase activity, and lowest mean malondialdehyde content, was observed in rabbits treated with CDDP and mononuclear cells (Table 4). There was no difference in mean superoxide dismutase activity or malondialdehyde content between rabbits treated with CDDP or mononuclear cells alone (Table 4). Acute inflammation and oxidative stress are primary features of the microenvironment of acutely infarcted myocardium.12,13 This tissue has marked neutrophil and monocyte infiltration, increased expression of inflammatory factors, decreased level of superoxide dismutase activity, and increased malondialdehyde content. These features may persist until 7 to 14 days after the acute myocardial infarction. The present study confirmed that infarcted myocardium may be infiltrated with many leukocytes, and accompanied with low superoxide dismutase activity and high malondialdehyde content. Clinical studies have shown that stem cell transplant, including human umbilical cord blood mononuclear cell transplant, may be effective in treating acute myocardial infarction but may have limited efficacy on cardiac function.1-4 The limited efficacy of stem cell therapy for acute myocardial infarction may be caused by low frequency of survival of implanted cells in the myocardium.4-7 Most cells transplanted by intravenous or intramyocardial administration may be lost within 4 days after transplant.4,5 The main reason for the low survival of transplanted cells is apoptosis induced by the inflammatory response, oxidative stress, and myocardial ischemia after acute myocardial infarction.12,13 Therefore, protection of graft cells from acute death in the ischemic myocardium is important for clinical efficacy of transplant. Several methods may improve survival of implanted cells including Akt or Bcl-2 gene transfection.6,7 However, these methods may not be suitable for clinical application because of safety concerns about gene delivery in humans. Therefore, interventions that may improve the ability of the local micro-environment to facilitate cell survival and function of implanted cells should be experimentally effective and clinically practical. In the present study, treatment with CDDP improved the microenvironment of the myocardium after acute myocardial infarction, with inhibition of apoptosis, oxidative stress, and inflammatory reactions. Treatment with CDDP and mononuclear cells may increase survival of implanted the mononuclear cells and the protective effects of these cells on the ischemic myocardium. In addition, CDDP and mononuclear cells were synergistic in improving cardiac function. Therefore, the combination therapy of CDDP and mononuclear cells may be effective in treating acute myocardial infarction. There are several limitations of the present study. It is unknown whether or not the grafted mononuclear cells in the myocardium differentiated into myocardial cells. In addition, the mechanisms by which CDDP may mediate the inhibition of local inflammation and oxidative stress are unknown. In summary, this study provided experimental evidence that CDDP and human umbilical cord blood mononuclear cells may have synergic effects in improving cardiac function and morphology after acute myocardial infarction. Treatment with CDDP may improve survival of implanted human umbilical cord blood mononuclear cells in the infarcted tissue. Further study is warranted to evaluate this treatment in patients who have acute myocardial infarction and who are candidates for emergency coronary intervention. Dai W, Kloner RA. Bone marrow-derived cell transplantation therapy for myocardial infarction: lessons learned and future questions. Am J Transplant. 2011;11(11):2297-2301. Strauer BE, Steinhoff G. 10 years of intracoronary and intramyocardial bone marrow stem cell therapy of the heart: from the methodological origin to clinical practice. J Am Coll Cardiol. 2011;58(11):1095-1104. Beitnes JO, Lunde K, Brinchmann JE, Aakhus S. Stem cells for cardiac repair in acute myocardial infarction. Expert Rev Cardiovasc Ther. 2011;9(8):1015-1025. Noort WA, Feye D, Van Den Akker F, et al. Mesenchymal stromal cells to treat cardiovascular disease: strategies to improve survival and therapeutic results. Panminerva Med. 2010;52(1):27-40. Hare JM, Traverse JH, Henry TD, et al. A randomized, double-blind, placebo-controlled, dose-escalation study of intravenous adult human mesenchymal stem cells (prochymal) after acute myocardial infarction. J Am Coll Cardiol. 2009;54(24):2277-2286. Yu G, Borlongan CV, Stahl CE, et al. Transplantation of human umbilical cord blood cells for the repair of myocardial infarction. Med Sci Monit. 2008;14(10):RA163-172. Joggerst SJ, Hatzopoulos AK. Stem cell therapy for cardiac repair: benefits and barriers. Expert Rev Mol Med. 2009;11:e20. Xin X, Zou H, Zheng N, et al. Metabonomic strategy to the evaluation of Chinese medicine compound danshen dripping pills interfering myocardial ischemia in rats. Evid Based Complement Alternat Med. 2013;2013:718305. Wang S, Wang ZJ, Zhao F. Experimental study on protective effects of tanshinol on oxidative stress injured vascular endothelial cell [in Chinese]. Modern Journal of Integrated Traditional Chinese and Western Medicine. 2011;15(20):2493-2494, 2496. Lin XD. Clinical trial of Compound Danshen Dripping Pill on ventricular remodeling after acute myocardial infarction [in Chinese]. World Chinese Medicine. 2011;5(2):111-112. Luo J, Xu H. Outcome measures of Chinese herbal medicine for coronary heart disease: an overview of systematic reviews. Evid Based Complement Alternat Med. 2012;2012:927392. Tongers J, Losordo DW, Landmesser U. Stem and progenitor cell-based therapy in ischaemic heart disease: promise, uncertainties, and challenges. Eur Heart J. 2011;32(10):1197-1206. Anonymous compound danshen dripping pills passed Phase II clinical trials by FDA. China J Pharm Econ. 2010;4:94. Shi RZ, Li QP. Improving outcome of transplanted mesenchymal stem cells for ischemic heart disease. Biochem Biophys Res Commun. 2008;376(2):247-250. Lin SQ, Wei XH, Liu YY, et al. Improving effect of Compound Danshen Dripping Pill on cardiac superficial blood flow and myocardial damage of I/R rats [in Chinese]. Journal of Chinese Microcirculation. 2012;22(2):21-23. Zhao N, Liu YY, Wang F, et al. Cardiotonic pills, a compound Chinese medicine, protects ischemia-reperfusion-induced microcirculatory disturbance and myocardial damage in rats. Am J Physiol Heart Circ Physiol. 2010;298(4):H1166-H1176. Acknowledgements: This study was funded by the Administration of Traditional Chinese Medicine, Hunan Provine, China (No. 2100045).